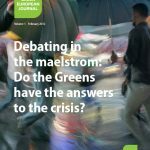 Debating in the Maelstrom: Do the Greens Have the Answers to the Crisis? On January 23th and 24th, the Heinrich Boell Foundation organised a conference on the future of Greece inside the European Union. “Hellas in der Krise. How can Greece reinvent itself inside Europe?” The economic situation of Greece and the uncertainty about the future of the Eurozone, but also the rejection of the Greek political system by a growing part of the Greek society gave a passionate dimension to the debates held in the crowded headquarters of the Boell Foundation in Berlin. In the fringe of the conference, Nikos Chrysogelos who is now member of the European Parliament for the Green Greeks and Viola von Cramon, member of the Bundestag, debated the lessons of this crisis and how the German and Greek Greens can cooperate in order to develop an alternative long term project. Green European Journal: Viola and Nikos, you are both coming from two countries which are playing a key role in the current crisis. You are currently working on a green cooperation project between the German and the Greek Greens but before coming to this project, it is interesting to cross your perceptions of the current crisis in your respective countries. Nikos Chrysogelos: When we talk about the crisis in Greece, there are two options. One is to mention only its fiscal and economic aspects and the other is to consider it in a broader perspective as the crisis of the existing development model. What is at stake here is not only Greece’s import/export deficit or the public deficit; it is also the functioning of the Greek society, its values and priorities. Nowadays, there is such a high rate of unemployment (and mainly among young people) that we seem to be pushed back to the sixties, when a lot of Greeks left the country to find a job in other European countries. So we need a completely different policy to change the economy, the public administration and to develop social cohesion. But it is not only a Greek problem. It is also a European problem: part of the cause of the problem in Greece is the Eurozone model. Yes, but just to come back on my first question, about the perception of the people in Greece, how do they perceive the role of Europe in this crisis and of the European institutions? Do they consider it (Europe?) as a solution or as a problem? NC: The fiscal crisis in Greece has been transformed into a deep economic and social crisis. On the one hand this is due to the serious structural problems of the Greek economy overall, the characteristics of the Greek political system and the inefficient policies that all governments in the past decades have applied. On the other hand, it is also due to the fundamental, structural problems of the eurozone as a whole and the absence of European leadership that could have recognized earlier on that the Greek crisis is part of a larger eurozone crisis and then envisioned and applied an effective European strategy for addressing this crisis with an emphasis on southern countries. Instead, the recipe of the troika (European Commission, ECB and IMF) was proven to be inefficient and instead of helping address the fiscal crisis, it managed to transform it into a deep economic and social crisis. Consequently, most of the Greeks just see the results of the current policies: there seems to be no future for the young people and for the unemployed. They do not understand why they should accept it. But if you want to reform the society, the society must be part of the solution. If the people are against the reforms, the reforms will fail. Hence, a majority of the society is angry against the Greek political system and against the European policy. What is the Green alternative and how is it perceived ? NC: The Greens propose to develop the dialogue with the society and to draw an alternative plan in which the entire society will participate. This plan should contain fiscal measures, of course, but it should also drastically change the economy towards the direction of sustainability. For example, we can change the construction industry by investing in the reduction of energy consumption and we can also invigorate the cities by promoting ecological landscaping inside the cities. The same change of direction is needed for energy, transport and tourism. For the moment, the Greens are not yet sufficiently established in the society. We have nine regional councillors and we participate in some local councils in big cities like Athens or Thessaloniki. But my experience is that when we discuss our proposals with the social partners, people from NGO’s and the civil society, they see that we are offering a different perspective. On the other hand, it is true that what the Troika proposes does not agree with our direction. And many of the people say “good ideas, but how can we change the situation?” So we need tools to promote our ideas in the daily life. Viola, as a member of the German Bundestag, you have been several times in Greece. How do you see the perception of the situation there and in Germany, for example in your own constituency? Viola von Cramon: We need, as Nikos rightly said, a more positive image of Europe. After two years of the crisis the Greek/German relations are, to put it mildly, not in the best state. Partly because the German government acted too little, too low and too late. In my constituency in Germany, I try to address this debate. It is my role as a Deputy. In conversations with citizens, I often explain my viewpoint, why Greece belongs to the European Union and to the Eurozone. As Greens, whether from Greece or Germany, we are always trying to work from the grassroots level, with the people’s participation. In the beginning of November 2011, I have been travelling with a Bundestag delegation to Athens, just as Prime Minister Papandreou proposed a referendum on a new austerity package. On that evening we had a very interesting panel discussion organised by the Greek Greens with the mayor of Athens. It was a very intense moment. Everybody was completely nervous and stuck to the television. We were afraid that nobody would show up, and finally it was pretty crowded and we debated almost three hours. People were really interested in listening and getting involved in order to improve the quality of life in their city together. The newly elected Mayor of Athens, who participated in the debate, was absolutely open to new ideas. There is not more activism in municipal politics in Germany than in Greece, but it is harder to make a difference due to lack of the local political structures. So we need together to find ways to give more power to the people and more power to the municipalities. You have been working on a common program for the Greek and German Greens, can you explain it? VvC: In the Green Group of the Bundestag, we published a position paper for a “new impetus for German-Greek collaboration” . It is a matter of personal engagement and solidarity with Greece: My colleague Hans-Josef Fell for example does work closely with energy experts in Greece in order to promote renewable and decentralised energy production. We are also working on common proposals to strengthen sustainable tourism. We want to deepen municipal partnerships between Germany and Greece on various topics, varying from education and cultural exchange to practical questions like waste management. We are still at the point of collecting ideas, putting them together and trying to find people to cooperate with. NC: As a new member of the European Parliament starting February 2012, I am organising a meeting between local and regional councillors for sharing experiences on establishing social and community enterprises that will develop and utilise renewable energy systems. With our Green regional councillors, even if we only have one or two councillors per region, we can influence the strategies for regional development by proposing alternatives. It will be a long term process but it will work because we are almost the only political group to present alternative solutions and the people accept them very well. VvC: The Greek Greens have a good chance to gain more influence in this situation. In Eastern Germany, we faced a similar situation after German re-unification. In the beginning, we were quite isolated. But nowadays we are nearly represented on all levels of parliament across Eastern Germany. So the prospects for Green approaches have improved very much over time and the same thing will happen to you. NC: We do not have only a short term strategy. We also have a long term strategy. We hope that if we (the Greek Greens) work in a better, more efficient way, we will be able to influence the society. Most of the Greek people do not know the Greens. But when they discuss with us, they are ready to cooperate with us, like we already cooperate with farmers, trade unions, social groups, NGOs. Nevertheless, we still are a small party. But you are not identified as being part of the system? NC: No, we are identified as being outside the system. VvC: That is true. Most of the politicians in the national parliament seem so far away from what is really going on in the rest of Europe and within their own society. They just see their own position; their own seat that will probably be gone after the next election. At first a lot of people in Greece were committed to the structural reforms, but that changed after the third reform package. There is a great deal of frustration about the high social costs of the austerity packages, especially for the weakest parts of the population. What is the evolution in the civil society? NC: There are new groups that are very active. For example, there have been demonstrations for the rights of bicyclists in Athens which gathered between ten and twenty thousand cyclists. They are not only defending the right to move without a car. They are defending another way of life. There are also examples of new solidarities, for example in some social health centres with volunteers who support people who are not able to pay money for their healthcare. It is not well developed, it is not structured and it is not yet represented at the political level, because, as Viola said, the politicians are distant from the real, everyday life of the people. As Greens, we propose to develop alternative social infrastructures in order to improve the quality of life for the people who just have €700 to live in Athens, which is practically impossible. Instead of raising the wages or the social allocations which is also nearly impossible, we propose to focus on upgrading social and public infrastructures in transport or in health for example. But this is precisely not happening today because there are cuts, for example in the rail transportation system. NC: … also in the health system…everywhere. But this is really the wrong policy because we need to develop an efficient public sector in order to give to the people the opportunity to survive and have a decent quality of life without a lot of money. On the other hand there are too many people working in the public sector because of clientalism. NC: Yes, but not in an efficient way. It is a quite bureaucratic system. There are a lot of doctors working for the administration and there are a lot of islands without doctors… That is the reason why we want to develop a social sector that will cooperate with a more efficient public sector and with a private sector working in a clearer legal framework, without black market-type interconnections. One of the conclusions of this conference organised by the Boell Foundation is that the changes needed are deep and will take a lot of time and new commitments from both sides: Greece and Europe. Don’t we need something like a strategic contract between the European Union and Greece? VVC: There was a fundamental mistake in the structural reforms package by the troika programme from the very first moment on, because it was designed on wrong assumptions. Everyone thought Greece only had a debt problem, that could be gone within three years. Of course this does not work. After realizing that this was unrealistic, the IMF should have switched to a more long term perspective. Behind the scenes, the German government discovered that very quickly. But it was not willing to communicate it to the European institutions and to our public. They should have communicated this more transparently by saying that supporting Greece would take more time and money and could only be achieved by a common long term agreement. NC: I totally agree with Viola. All of Europe has to learn from the Greek crisis. This is the most important… it is not only the result of the cumulative errors of the Greek policies; it is also the result of the Eurozone model. But we have to develop a longer term vision for Greece for 2020 and 2030. And then we should discuss it and develop a closer European cooperation. Of course, in Greece we have to change the issues that are connected with our values, with our way of functioning, with our way of doing politics, with our way of developing our economy. But European and other countries have to learn from this experience and develop their own long term strategy. VVC: Let me add that the question of “conventional” growth as such is not the key issue. What we need is sustainable growth: we don’t need more roads or bridges. I really dislike thinking about the fact, how many billions of euros from taxpayers from across Europe went into Greece and didn’t have really sufficient positive long term effects. Instead the EU should support education and universities, which is a more knowledge based economy approach. We should also need a more participatory approach in supporting Greece, which means that e.g. we need to work with NGOs in figuring out how to get energy decentralised. NC: The biggest danger is that even now in Greece the key issue remains growth, at any cost, and if there are investments, they are mostly on new highways… There are €5bn of investments, for the highways, and €1.5bn for the security system. This is crazy. With €6.5bn we could establish and finance local companies to involve young people and give them new perspectives, new opportunities, new hope. NC: What we need is a combination of the good “traditional” values of solidarity and social interest with a green modernisation. We may not come back to the old traditions, but we should look for a new combination of solidarity, modernisation and of course green innovation.